TLS, or "transport layer security", and its predecessor SSL, which stands for "secure sockets layer", are web protocols used to wrap normal traffic in a protected, encrypted wrapper. Using this technology, servers can send traffic safely between the server and the client without the concern that the messages will be intercepted and read by an outside party. The certificate system also assists users in verifying the identity of the sites that they are connecting with. 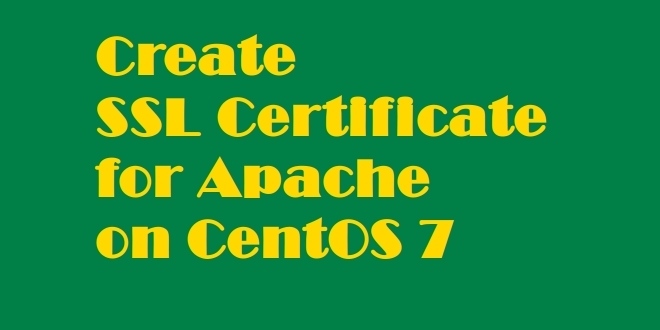 In this article, we will show you how to set up a self-signed SSL certificate for use with an Apache web server on a CentOS 7. A self-signed certificate will not validate the identity of your server, since it is not signed by a trusted certificate authorities, but it will allow you to encrypt communications between your server and your visitors. These steps can also be performed on Red Hat Enterprise Linux, Fedora, Debian or any other equal Linux distribution. You will need access to a CentOS 7 server with root or a non-root user that has sudo privileges. After these steps are complete, you can log in as your non-root user account through SSH and continue with the tutorial. The module will automatically be enabled during installation, and Apache will be able to start using an SSL certificate after it is restarted. You don't need to take any additional steps for mod_ssl to be ready for use. Now that Apache is ready to use encryption, we can move on to generating a new SSL certificate. The certificate will store some basic information about your site, and will be accompanied by a key file that allows the server to securely handle encrypted data. req -x509: This specifies that we want to use X.509 certificate signing request (CSR) management. The "X.509" is a public key infrastructure standard that SSL and TLS adhere to for key and certificate management. -nodes: This tells OpenSSL to skip the option to secure our certificate with a passphrase. We need Apache to be able to read the file, without user intervention, when the server starts up. A passphrase would prevent this from happening, since we would have to enter it after every restart. Fill out the prompts appropriately. The most important line is the one that requests the Common Name. You need to enter the domain name that you want to be associated with your server. You can enter the public IP address instead if you do not have a domain name. We now have all of the required components of the finished interface. The next thing to do is to set up the virtual hosts to display the new certificate. Find the section that begins with . We need to make a few changes here to ensure that our SSL certificate is correctly applied to our site. First, uncomment the DocumentRoot line and edit the address in quotes to the location of your site's document root. By default, this will be in /var/www/html, and you don't need to change this line if you have not changed the document root for your site. However, if you followed a guide like our Apache virtual hosts setup guide, your site's document root may be different. When you are finished making these changes, you can save and close the file. In your web browser, try visiting your domain name or IP with https:// to see your new certificate in action. Your web browser will likely warn you that the site's security certificate is not trusted. Since your certificate isn't signed by a certificate authority that the browser trusts, the browser is unable to verify the identity of the server that you are trying to connect to. We created a self-signed certificate instead of a trusted CA-signed certificate, so this makes perfect sense. Once you add an exception to the browser's identity verification, you will be allowed to proceed to your newly secured site. You have configured your Apache server to handle both HTTP and HTTPS requests. This will help you communicate with clients securely and avoid outside parties from being able to read your traffic. If you are planning on using SSL for a public website, you should probably purchase an SSL certificate from a trusted certificate authority to prevent the scary warnings from being shown to each of your visitors.